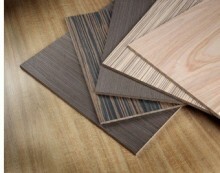 If not in stock, we have access to 15 species of decorative veneer faced plywood, MDF or particle board core. Although we mostly stock 4 x 8 sheets, we can supply various sizes and thicknesses. These sheets can be custom beaded or grooved as your project requires. We can cut down your material into strips or panels. Cutting down these 4 x 8 sheets greatly reduces shipping and packaging cost. At present, prices from our mills have been varying wildly. Until the mills stabilize pricing, please email in your request.